The ultimate space saver. 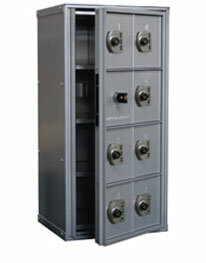 Our keyless Mini-Check® Micro Lockers are compact and constructed from non-corrosive aluminum. These space-saving units offer 7 compartments and feature an innovative keyless mechanical lock system enabling users to set and re-set their own codes. Stay in control with a master override key in the event of forgotten passwords. Black filled ¾” H permanent engraving. Allows management access to all compartments; swings on continuous extruded aluminum hinge; secured from top to bottom by extruded lock bar. 7 patron doors, 6063 extruded aluminum, .100” min. Clear opening 4-3/4” H x 3-5/8” W x 7-3/4” D.
3-digit user changeable combination locks with master key override. Powder coat paint in silver, gold and bronze or natural anodized aluminum. Other color options available. 21-1/8" H x 8-1/2 W x 10-3/8” D.